Hollis Frampton is most well known as an independent filmmaker, but has been lecturing and writing about photography, film and video for a long time and in many places and publications. Circles of Confusion assembles eleven articles from exhibition catalogs and from October and Artforum. 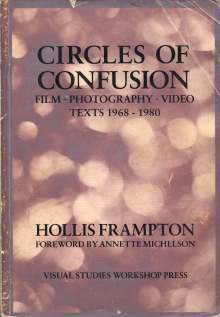 What Frampton does as a critic is much like what he does as a filmmaker, which is to strip the creative process down to its basic elements, then arrange and display the components..
Framptont’s role in this is critic-as-conjurer . He prestidigitates ideas and illusions from everywhere–history, psychology, philosophy, literature, even archaeology, whatever might apply. However much he may circle, though, he always comes back to basic ontological questions. What is photography? Film? Video? What are the properties that make them unique? What has film to do with narrative? Photography with space and time? Beyond a king these questions Frampton also conjectures about the possible ways of asking them and the likelihood of getting an answer. He also plays the role of critic-as-authoritative-voice, but by exposing the jagged mechanisms of thought makes the reader much more than a participant in the process than is usually the case.